Following up on last week’s post discussing the survival of Precolumbian gladiatorial combat in honor of Tlaloc in Mexico, I’ve got a video today that actually shows part of a Tigre whip match at Zitlala. Now that this activity has come to my attention, it’s something I’ll be watching for videos of in addition to Danza Azteca. It’s interesting getting to actually see the story behind the jaguar mask and contemplate the deeper meaning behind the fighting. In case you’re wondering, the special rope club used by Tigre fighters in Zitlala are called cuertas. The modern cuerta itself is actually a “friendlier” version of heavier rawhide and stone clubs used previously, which in turn were descended from stone and shell clubs used when the battles may well have been lethal. For obvious reasons, the present-day trend has been away from fatal contests, though the underlying meaning of giving of oneself to Tlaloc for a plentiful harvest endures today among those who remember. Came across an interesting photograph recently that’s quite interesting, as it shows an aspect of a Pre-Columbian ceremony still surviving today in Zitlala, Mexico. Tigre Fighter With Whip & Jaguar Mask. Copyright 2008 by the Associated Press/Eduardo Verdugo. Used without permission. Link to original photograph source. Now…there’s a lot more going on here that the photographer doesn’t get into in his note. Specifically, that this is a modern survival of traditional indigenous religious practices. Why do I think this? Let me explain. There’s a certain ancient god of rain in Mesoamerica who has traditionally been associated with jaguars… and that’s Tlaloc. In the codices, if you look carefully you can see that He’s always depicted with long, fearsome jaguar fangs. The growl of the jaguar resembles the rolling of distant thunder, and the dangerous power of such an apex predator fits the moody, explosive-tempered Storm Lord quite nicely. 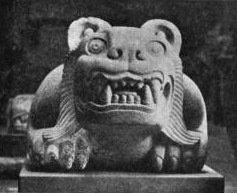 The jaguar as a symbol of Tlaloc is a very ancient tradition that appears across the whole of Central America, whether the god is being called Tlaloc, Cucijo, Dzahui, or Chaac. The whip-club is another hint. Flogging has been done as part of rain ceremonies for Tlaloc for centuries (I wouldn’t be surprised if it’s symbolic of lightning). Additionally, though the photographer didn’t mention this, one knows what happens when people strike each other hard with whips like the one the man in the photo is shown carrying — you bleed. A lot. In Prehispanic Mexico, one of the important rituals for Xipe Totec, the Flayed Lord, god of spring and new growth, is called “striping.” Striping involved shooting the sacrificial victim with arrows for the purpose of causing his blood to drip and splash on the dry earth below, symbolizing rain that would bring a good harvest. Similar rituals specifically devoted to Tlaloc were also done, and I wouldn’t be surprised if the gladiatorial combat done for Xipe Totec had the same basic idea in mind, sprinkling blood over the ground done to call the rain. The next part is due to my good friend Shock and her impressive knack for research. While we were discussing this photo, Shock directed me to an excellent article about this phenomenon known as “Tigre Boxing” that still exists all throughout Mexico today. It even discusses this specific form of battling with whips in Zitlala that this photograph is of. I highly recommend checking it out, as it’s loaded with more information about the surviving practice of gladiatorial combat for rain, complete with many excellent photos of the jaguar masks, sculptures, and even videos of the combat! Click HERE to go to the Tigre Boxing article.